Let’s face it, we all procrastinate sometimes. But when you finally work on your task, it’s often not as hard as you thought, and you wonder why you wasted so much time avoiding it. The truth is it’s not too late to get things done. Wouldn’t it be nice to tick things off your to do list, and finish the year on a high? Whether it’s improving your health, tidying your office, or writing that blog, it can be done and you deserve that satisfaction of finishing strong. You can avoid procrastination altogether if you do things while they are easy. Whether it’s bills or dishes, if you do them immediately, they don’t build up! When something seems too big and overwhelming, set a timer for 15 minutes, and see how much you can get done. I once got all my taxes done by timing myself for 15 minutes over and over, until they were all done! Set yourself a deadline, then tell someone or write it down. I decided, for example, to get certain tasks competed by the end of November, and the result is I’m getting more done than if I had left it open ended. “I can and I will” is a useful and positive phrase for self-talk when something feels impossible and you feel discouraged. Ask for help and see if a few friends might join you to get challenging things done, whether it’s spring cleaning, finishing an assignment or taking a cleanse to improve health. I am in a bi-weekly group, for example, where we set intentions which we write down, then report back at the next meeting on how it went, which has helped me get a lot of things done because I feel accountable to the group. Another idea is to set aside a day or half day for decluttering, for example, and arrange with a friend with a similar goal that you will talk on the phone every hour or two, to plan next steps and report on progress or challenges. I was able to tidy my whole office with the help of a friend last year, just by calling each other for a short check in every 1.5 hours, and reporting back on how we were doing and next steps. Remember that clutter takes up energy, so you will probably feel energised and empowered once it’s gone. Sometimes I’ve found I’m so motivated after tidying up, I feel ready to take on other challenging tasks. If you are someone who feels procrastination has robbed you of the pleasure and satisfaction of getting certain things completed before the end of the year, it’s not too late! 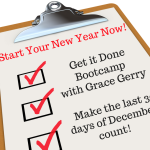 Check out my “Get It Done Bootcamp” which runs from Dec 1-31, to help you get those challenging tasks completed, and finish the year on a high. Email grace@gracefulsolutions.ca to register for this small group program – only 8 spots or click here for more information.